Treats are in store for Children this autumn half-term when the ghoulishly good Octoberfest returns to Buxton. There are both craft-making and theatre workshops to take part in as well as drama shows to see over the week-long festival at Buxton Opera House & Pavilion Arts Centre. For a low cost family event (£2 a ticket) follow the witches’ trail on a journey through the Pavilion Gardens in the frighteningly good Scare Trek (October 22 and October 24 to 29). Families just need to collect a map from the box office nd begin finding clues to the missing words. Other take-part events include An Elephant in the Garden Craft workshop (October 24 and 25). Youngsters can get stuck in and make their very own Elephant in the Garden, using a milk carton. Older children are in for a treat as they get to recreate one of R.L Stine’s much loved books Goosebumps Welcome to the Dead House, live on stage in a practical day long theatre workshop (October 26). Teenagers can look forward to a Halloween themed party night, Indigo Nights (October 28) where there will be live bands and a ‘selfie corner’. Octoberfest theatre shows include the Three Half Pints (October 23), stars of Comedy Club 4 Kids and CBeebies’ Spot Bots, as they stumble their way through a new comic misadventure Bad Guys. Michael Morpurgo’s An Elephant in the Garden will be brought to stage (October 24 and 25). 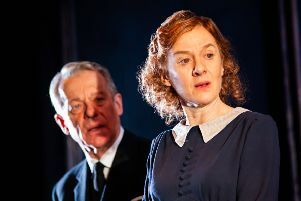 The play tells the story of Lizzie, her mother and an elephant who flee from the allied fire bombing in Dresden Germany, during the Second World War. For more information about Octoberfest, contact 01298 72190 or visit www.